A pest extermination campaign is under way on western China’s Qinghai-Tibetan Plateau. But experts say there is no scientific basis for the killing of the pika, a small rabbit-like mammal, and warn that the campaign may throw the ecosystem further out of balance. The culling is part of the second phase of a campaign to protect and strengthen the ecology of Sanjiangyuan (also known as the Three Rivers Source area). As of March 17, it was already 38% complete, with 17.7 million mu (11,800 square kilometres) covered, according to media reports. But the value of these efforts has been queried both by experts and the public. Lu Zhi, founder of Chinese NGO the Shan Shui Conservation Center and a professor of conservation at Peking University, says that “this ‘protection’ should be stopped.” She argues that there is no scientific backing for the efforts, and they will simply deliver another blow to the natural balance of the region. The Sanjiangyuan region lies in the heart of the Qinghai-Tibetan Plateau and is the source of the Yangtze, the Yellow River and the Lancang. It is also one of the most unspoiled and most vulnerable of all the world’s ecosystems. Between the 1970s and 2004, more than 40% of Sanjiangyuan’s grasslands suffered degradation, according to state media agency Xinhua. Pests like the pika took much of the blame: at the peak of infestation, 17% of the Sanjiangyuan Nature Reserve was affected. This came to be regarded as a major cause of degradation to the grasslands and the ecosystem. To halt the damage, China’s State Council approved a 7.5 billion yuan funding package for the first phase of a programme to protect and improve the region’s environment. By 2013, extermination work had been carried out on 117.8 million mu (78,500 square kilometres) of land, at a cost of 157 million yuan. Of 26 sub-projects, pest extermination ranked among the most important, along with fencing, fodder subsidies and relocation of herders. According to plans approved by the State Council in December last year, the second phase of that programme will see extermination across 46.7 million mu – the equivalent of five Shanghais – in 2014. Within that area 39 million mu are infested with the pika, and 7.6 million mu with the plateau zokor, a burrowing rodent. The government has adopted a simplistic narrative in which an excess of pikas has damaged the grasslands, and the solution is eradication, says Zhao Xiang, project coordinator at Shan Shui, which has worked on the region for years together with the Peking University Centre for Nature and Society. It’s a convenient explanation, with an obvious and accessible course of action, says Zhao, and as a result the pika has become a scapegoat. While the official line insists that pests are a main cause of grassland and ecological degradation, research shows otherwise: the pika is not the problem, and extermination will not control its numbers or help improve the grasslands. In fact, say experts, the pika is a crucial part of the grasslands ecology, and its elimination will cause a chain reaction that throws certain ecological functions into chaos. Schaller also writes that the pika eats vegetation which livestock ignore, as it is toxic or unpalatable to them. This prevents the spread of such plants, to the benefit of the grasses livestock do eat. 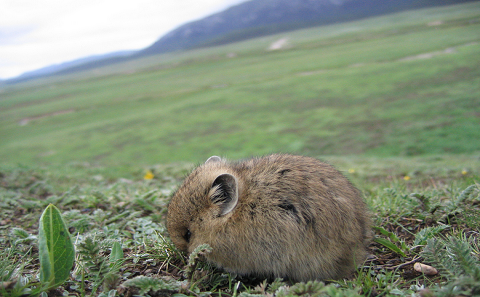 In 2007, a Peking University conservation study found the pika to be a crucial part of the grassland ecosystem. For example, the pika’s burrowing provides nests for many small birds and lizards, as well as promoting or hindering the growth of different plants. It is also an important source of food for the carnivores and birds of prey that live on the grasslands – almost the only one in winter, since it does not hibernate. These roles cannot be fulfilled by other grassland animals and are crucial for maintaining the stability of the grasslands ecology, the report concluded. There are also questions about the effectiveness of the population control efforts. Song Ruiling points to a study by New Zealand’s Land Management Institute into the Naqu grasslands of Tibet, where a spring extermination of the pika resulted in a temporary drop in numbers before the population quickly rebounded. By the autumn, it was almost back up to its original level. The extermination had only a small effect, and the population recovered after only a single breeding season. He Bing, Shan Shui’s Sanjiangyuan project coordinator, carried out a survey in a village called Suhurima. One herder told him: “There didn’t use to be so many pikas. There was an extermination campaign in the 1970s, and another six or seven years ago, but numbers just increased again. They breed so quickly, you’ll never kill them off.” Another said his family had put down poison to kill off the pikas in their small winter grazings, but the next year they were back – and the grazings were in even worse condition. A third herder observed that, once an eradication campaign is complete, nearby pikas will move in and increase populations again. Xie Yan, an academic at the Chinese Academy of Sciences’ Institute of Zoology, says that large-scale poisonings of wild animals should be halted. This includes the widespread use of pesticides and pest poisons in nature reserves. Lu Zhi agrees, pointing out that killing off the pika will also kill the carnivores that feed on it. But the tragedy is that, while pika populations will bounce back in two or three years, the carnivore populations will take much longer to recover. Without their natural predators, pika populations will run wild, “and nature’s balance is again broken,” says Lu. The official microblog of the Conservation Society of Amphibians and Reptiles, based at the Chinese Academy of Sciences’ Chengdu Institute of Biology, compared ecosystems to a garment knitted of strands of wool: if one strand shrinks or disappears, the garment ages or tears, and holes appear. Eventually, it will be irreparable. Zhao Xiang suggests that when it comes to pest eradication, research should guide environmental protection. Project outcomes should also be assessed by third parties, in a system involving public participation and openness of information. There are signs the government is softening its stance. On April 22, Wang Xiaofa, head of the grasslands department at the Qinghai Agriculture and Herding Office, told journalists “the Qinghai government has realised it cannot eradicate the pika, as this would be even more harmful for the ecology.” He outlined a new approach, where extermination would only happen when more than 150 active burrows were found within one hectare. This is progress. But data collected by Shan Shui and Peking University for the year 2012 to 2013 found that while there was an average of 4.4 active pika burrows per mu of land in swamp meadows (1 mu is 0.07 hectares), in alpine meadows and desertified grasslands there were 65, 85 and 25 pika burrows respectively. This means that in all cases except for swamp meadows, the government’s standard for extermination will be met. Researchers have been explaining since about 2003 to the grassland management policy makers that pika and zokor increase with grassland degradation is a response not a cause. (e.g. Gansu Agriculture University, Plateau Research Institute, Xining, CSIRO Australia) The advice continues to fall on deaf ears because tackling the real cause, overgrazing, is seen as too hard and too difficult to sell to local communities. The solution lies in alternative livelihoods and regeneration not in poisons and plantings. I remember similar advice being given, through the Biodiversity Working Group of the China Council for International Cooperation on Environment and Development, since 1998 or earlier. Disappointing to hear the ecology hasn't worked its way into policy since then. Kill the sparrow campaign ! Gan Runze is the communications officer at Shan Shui Conservation Center. Climate change poses new threats to life on the grasslands of the Tibetan plateau. Beth Walker introduces a week-long series about government responses to the challenge, their environmental and social effects.